Enter Salmonella, a rod-shaped microbe notorious for causing most cases of food poisoning. In 2006, researchers at Chonnam National University in Gwangju, South Korea, were looking to create a new cancer-fighting agent. They were also searching for a vaccine for the bacterium Vibrio vulnificus, which infects shellfish off the South Korean coast. 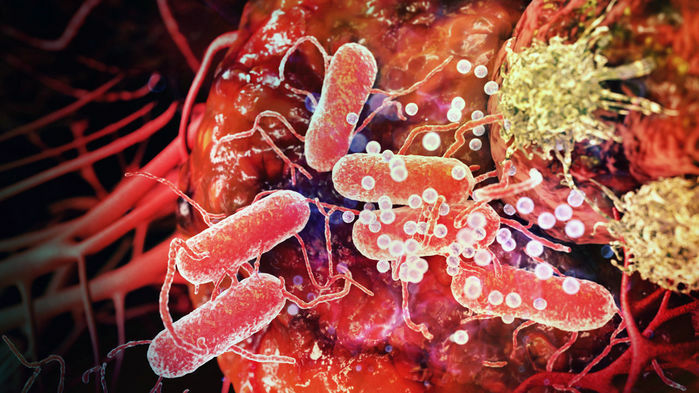 As they worked with Vibrio, they noticed that a protein in its flagellum—a whiplike tail used for swimming—triggered a particularly strong response from immune cells. So they took a harmless version of Salmonella typhimuriumand “weaponized” it, genetically modifying it to secrete the protein, known as FlaB.